Pictured (L-R): Citrus College Trustee Dr. Barbara R. Dickerson; Henry Custodia, Delafield Corporation; Kevin Morris, principal, Mt. Olive Innovation and Technology High School; Assemblywoman Blanca E. Rubio; Nadia Hillman, assistant superintendent, Duarte Unified School District; Citrus College Trustee Dr. Edward C. Ortell; Sheryl Lefmann, president/CEO, Duarte Chamber of Commerce; and Robert Cruz, public affairs manager, SoCalGas. 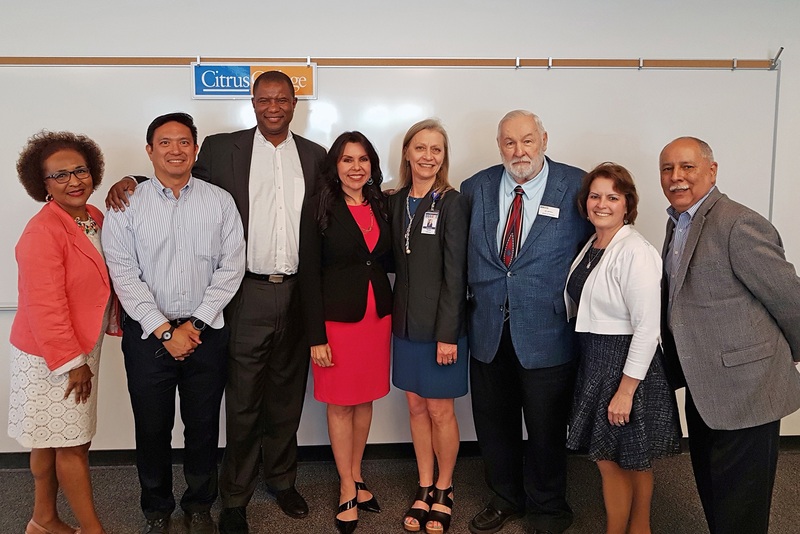 California State Assemblywoman Blanca E. Rubio (AD 48) convened a Workforce Development Roundtable at Citrus College. Co‐sponsored by Citrus College and the Southern California Gas Company (SoCalGas), the forum brought industry and education leaders together to share ideas and discuss solutions to address the regions growing demand for a skilled workforce. Chambers Of Commerce, provided the perspective of local businesses. growing gap between job openings and the availability of trained workers. opportunities that are available to students enrolled in the college’s CTE programs. planning to follow up on some opportunities for additional collaboration in the near future. Military Friendly® school. For more information, visit www.citruscollege.edu.